James was a top-10 finalist on the most recent season of LAST COMIC STANDING (NBC) and is a frequent contributor to COMEDY DEATH-RAY RADIO and other wild podcast. He performs standup and characters live at UPRIGHT CITIZENS BRIGADE and at festivals, theatres, dive bars, party schools and radical political events across North America. Other credits include HAROLD & KUMAR ESCAPE FROM GUANTANAMO BAY, THE LATE LATE SHOW (CBS), FACE TO BUSH (Comedy Central), WORDGIRL (PBS) and THE ONION RADIO NEWS, along with several underground cartoons and failed t.v. pilots. Selected as one of New York Magazine’s Top 10 Comics that “Funny People Find Funny, Ophira has appeared on Comedy Central’s Premium Blend and Fresh Faces of Comedy, VH-1’s Best Week Ever and All Access, Fox, E! Channel, the Oxygen Network, and the Discovery Channel. She also had her own 1⁄2 hour comedy special for CTV’s Comedy Now. She also received rave reviews for her performances at the Edinburgh Festival and recently the Montreal Comedy Festival. She’s a regular host and storyteller with The Moth, a storytelling phenomenon..
Jon is a writer, comedian and producer living in Brooklyn, NY. As an original blogger for Late Night with Jimmy Fallon he won two Creative Arts Emmy’s (Outstanding Achievement in Interactive Media). He is currently the creator/producer and host of the award winning popular variety show, The Rejection Show, and has produced, hosted and/or created many other unique live events, including The NYC Beard and Moustache Championships, comedy’s ECNY Awards, and the annual Delicious Sandwich Social. Jon’s first book, the award winning Rejected: Tales of the Failed, Dumped & Canceled, a humor anthology of rejected works, was released in 2009 with Villard (Random House). He performs regularly at literary events and stand-up comedy venues throughout New York City and beyond. 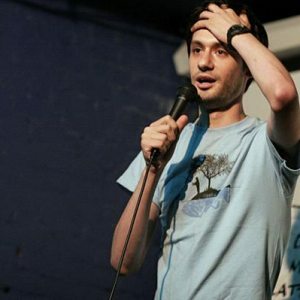 Adam was featured at the 2011 Montreal Just for Laughs Comedy Festival and on College Humor. He is releasing his first CD Not for Horses on 7.26. You should come to his CD release party, contrary to all naming logic, there will be a horse in attendance.